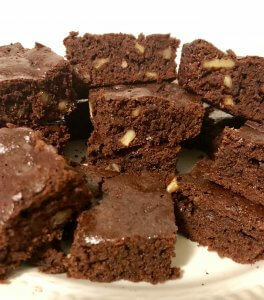 These brownies taste just like brownies should taste. You would never know they are gluten free and grain free. To make totally Paleo, use dairy-free chocolate chips. I have found similar cassava flour brownie recipes, but I have altered it to by 1/2 cup less of sugar and added the baking soda option. 5 tbs of butter Earth Balance or coconut oil. For more cake-like brownies, 1 pinch of baking soda. Bake for 25 min. For gooey brownies omit the baking soda and bake for 30 to 35 min. 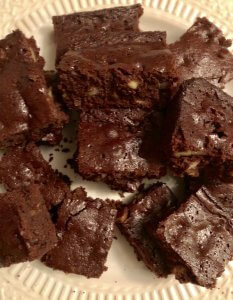 Brownies will seem underdone but that is how they should be when taking out of the oven. Melt chocolate chips and vegan butter in a saucepan, stirring with a spatula, add vanilla. In a mixing bowl add all dry ingredients. In a small bowl, whisk eggs. Add eggs and chocolate mixture to mixing bowl. Mix well with a spatula. Pour batter into the pan. Bake according to instructions above if using baking soda or not.